Turns out, companies with unique names get more funding in the early stages. As a startup, landing funding is one of the most difficult things to do, but it’s also one of the most important. And whether you’re in the early stages of your startup or well into business, there are certain trends you should know about in order to maximize the funding you receive. So before you go off into the world seeking funding for your business, check out these seven strange funding trends. Startups with unique names get more early-stage funding. A study from the academic journal Venture Capital found that startups with funky names typically get more funding from investors, venture capitalists and even crowdfunders. Just look at Uber and Lyft. However, this only applies to the beginning of a business because there’s so little information out there about a company that a unique name helps it stand out. Unique names can make investors feel uncomfortable later on. Once a business is past those early stages, having a unique name isn’t very beneficial -- in fact, it can actually have the opposite effect. According to the study published in Venture Capital, after a company has proven to be successful, investors aren’t looking for a catchy name, they want to know about the financials of the company. A unique name actually makes investors feel uncomfortable in the later stages of funding. Even startups in small cities get a lot of funding. You don’t need to be in a big city to get the funding your business needs. While startups in big cities such as San Francisco and New York attract many investors, even smaller cities such as Austin, Texas, Plano, Texas, and San Mateo, Calif., also see a large amount of startup funding, according to the report by startup database Fundz. Tech startups dominate big cities. When it comes to funding, tech startups seem to get the most attention from investors in big cities. However, according to Fundz, investors in smaller cities and areas in the rest of the country seem to be focused on startups outside of the tech industry. 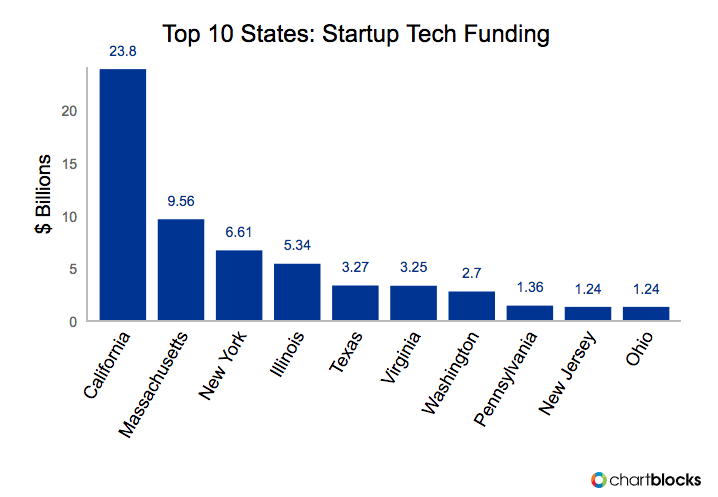 Tech startups in New York get more funding than those in San Francisco. 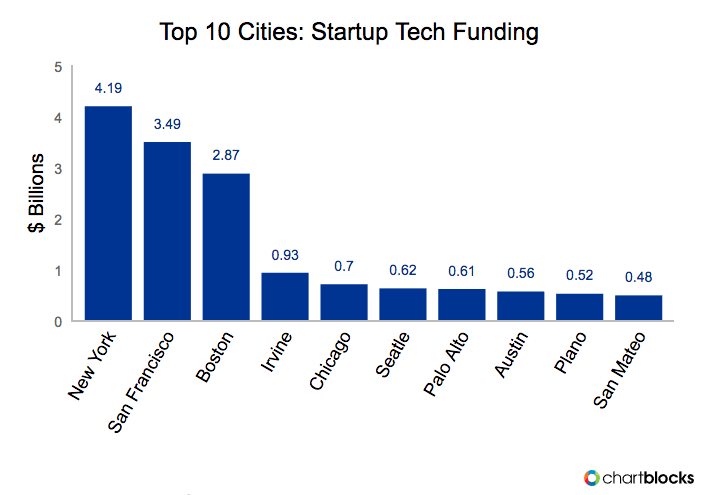 The Bay Area isn’t the leader when it comes to startup funding. In fact, according to Fundz data, New York City startups have received more tech funding -- approximately $4.19 billion over the past two years. San Francisco tech startups have received about $3.49 billion in funding over the same time frame. Health-related tech startups are getting the most funding. If you’re looking to launch a tech startup, steer towards healthcare and medicine. Health-related industries such as biotech and pharmaceuticals are receiving the most funding in the tech sector, according to Fundz. California has more funding than Massachusetts, New York and Illinois combined. While San Francisco itself may not receive the most tech startup funding compared to New York City, that doesn’t mean the state as a whole is lagging behind. California receives more startup funding than Massachusetts, New York and Illinois combined -- despite each of these states being homes to major cities.